This is a very simple mixer which I use often in the shack for testing things. It is unbelievably useful! It has two RF inputs. I feed one with the output of my 10MHz GPS-disciplined OCXO project, or a crystal oscillator, etc. The other input it typically fed from something I'm testing, e.g. an Ultimate3S QRSS/WSPR transmitter. The resulting audio output is fed to a PC or Laptop for analysis in Argo. I had an old Logitech USB headset, which got broken years ago. These days I use it as a "soundcard" dongle for my old laptop, because it is a lot better than the noisy result of plugging audio into the laptop's "mic" input. A recently added feature of this mixer is the 1pps input. This is fed from the 5V 1pps output of my QRP Labs QLG1 GPS receiver kit. It produces a 100ms pulse every 1 second. The leading edge indicates the start of each second, with very high accuracy. 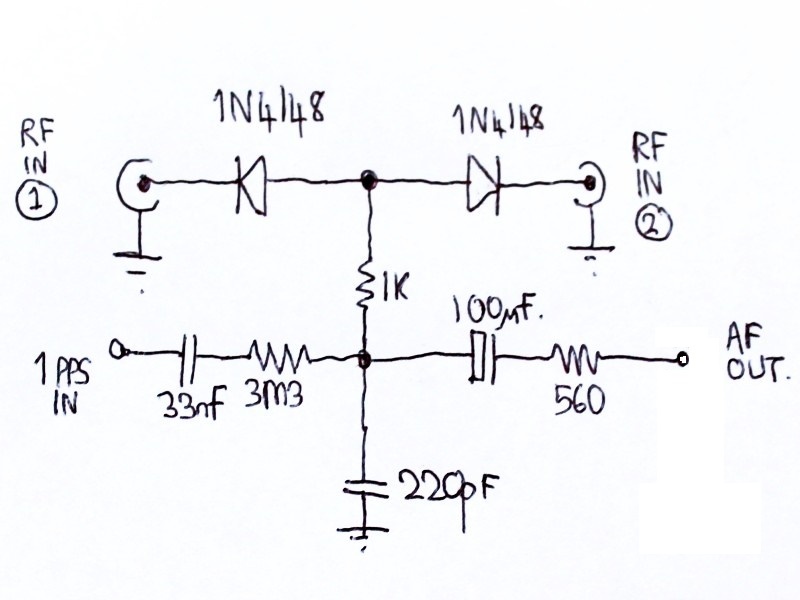 If this input is connected, then it produces a little spike at the start and end of the 0.1s pulse. This Audacity audio recording shows the spikes. You can see how useful that is, if you want to measure the precise timing of something. This test mixer is housed in an Altoids tin, with BNC sockets for the RF inputs, a 3.5mm jack socket for the 1pps input, and a 5-pin DIN socket for the audio output.